2018 is coming real close. Most us are considering buying gifts for beloved ones and friends. Why not make them happy with one of these great calendars. The happy face of the lucky one who receives one definitely makes a good start for 2018. 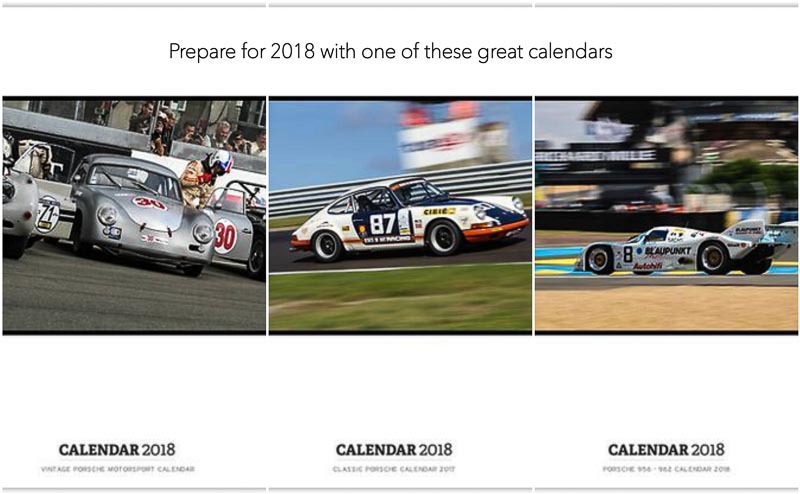 And btw when you buy one for yourself, you can enjoy the complete 2018 of some great artwork of classic Porsches and vintage motorsport pictures. Group C racing has been dominated for a while by the legendary Porsche 956 and Porsche 962 cars. Today they are still used in many classic races like Le Mans Classic, or the Rennsport Reunion. The calendar shows some of these iconic cars right on the spot where they belong : the race track. This calendar is a true time travel back to the 50s, 60s and 70s. Legendary race cars from all makes on the most iconic race tracks. Stunning black and white motorsport pictures are your part with this great calendar by McKlein Publishing. Every Porsche has motorsport in its genes – from the 911 GT2 RS to the Cayenne S. And this is exactly what the sports car manufacturer is now showcasing with its photo shoot of the current vehicle range. The vehicles have been photographed on the test track and also in front of the workshops belonging to the top-secret development centre in Weissach and Flacht, the heart of Porsche Motorsport. Calendars available at your local Porsche dealership.